Tag line: "The Bat, the Cat, the Penguin"
A sequel to his runaway 1989 hit, Batman, director Tim Burton once again returns to the dark world of Gotham City, which, in this movie, seems slightly darker than before. It’s Christmas in Gotham, where the nights are anything but silent. Having subdued the Joker, Batman (Michael Keaton) now has to contend with two arch-criminals. First on the list is Oswald Cobblepot, better known to the world as The Penguin (Danny DeVito). Born with a deformity, he was discarded by his parents (Diane Salinger and Paul Reubens), who tossed him into the sewers when he was an infant, where, instead of meeting his doom, he was raised by a flock of Penguins. Ready to rejoin “normal” society after decades underground, he turns to corrupt millionaire Max Shreck (Christopher Walken) for guidance, and before long, the Penguin is well on his way to respectability. In fact, he even decides to run for Mayor! Next up is Selina Kyle (Michelle Pfieffer), the meek secretary who, after being pushed out a window by Shreck and falling several stories into an alley, changes her entire persona. Donning a homemade costume, she becomes Catwoman, and plots her revenge against Shreck. Things take an unexpected turn, however, when she falls in love with Batman’s alter ego, Bruce Wayne. The Gotham of Batman Returns is every bit as dark as that of Batman (the opening sequence, where we flash back to Oswald’s birth and eventual abandonment, is appropriately disturbing). But while the look and feel of the city remains the same, the set pieces this time around are more elaborate, with larger buildings and a sprawling sewer system to give the characters room to spread out. As for the villains, DeVito disappears behind his grotesque make-up, bringing an animal-like intensity to the Penguin that makes him completely unpredictable (in one scene, he bites the nose of an assistant hired to work on his campaign for Mayor). Pfieffer is deliciously seductive as Catwoman, slinking around in tight black leather, while Walken’s shifty performance as Max Shreck (gotta love the name!) adds another effective baddie to the ranks. Keaton is again strong as Batman, but like in the initial film, the caped crusader takes a back seat to his adversaries, who are the real stars of the show. Burton would leave the series after Batman Returns, turning the reins over to Joel Schumacher, with mixed results (1995’s Batman Forever, while not up to the standard of the first two movies, has its charms, but Batman & Robin is damn near unwatchable). 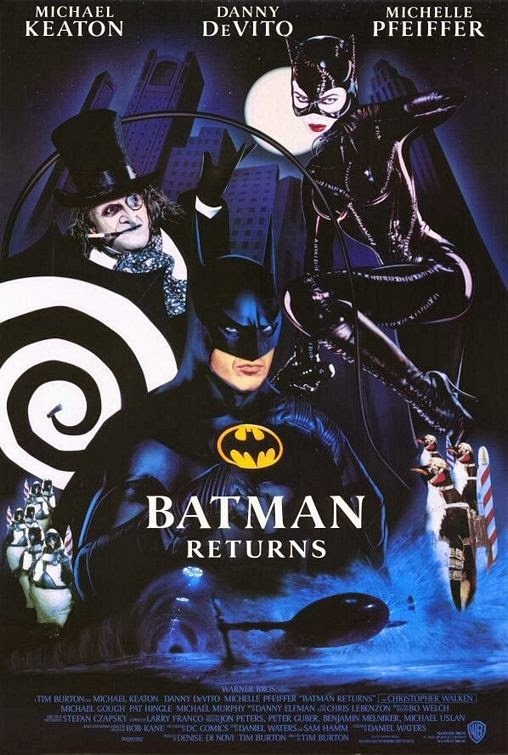 Yet, despite what followed, Batman and Batman Returns are still solid films, and just as entertaining as when they were first released.